“I would tell young people to learn music by trying to listen to music and even better go and see it live. Some of the most beneficial learning experience in my music has been from going to see great concerts. This month, Amazing Kids! is proud to introduce you to eight extraordinary kids who won the 2009 Spotlight Awards, an arts competition held each year by the Los Angeles Music Center, a performing arts center in Los Angeles, California. Whether it is dance, instrumental, vocal or 2-dimensional art, these talented young artists are passionate about their art and work hard at it! Artists are often sources of truth, harmony and meaning and an artist can often make us to pause and think like no one else can. The young Spotlight Award winners are no exception. As these fine young artists continue to grow in their art and in their artistic lives and careers, they have a unique power to help us to see the world differently. We at Amazing Kids! hope that by reading about them and their passionate pursuit of their art, they will inspire you to find your own artist inside, and to explore your own creative ways to raise questions, and invite others to think about, the issues that matter most to you. Don’t forget: If you, or a young person (or persons!) you know, has an amazing project you are involved in, or a special skill, talent or ability you want to tell the world about, be sure to let Amazing Kids! know about it! Simply complete our Amazing Kids! of the Month award online nomination form, visit our AKOM nomination information page (www.amazing-kids.org/nomination.htm#nomination) or email us! The Music Center, situated in downtown Los Angeles, California, was dedicated in 1964 as a ‘Living Memorial to Peace’ and soon became one of biggest icons of the cultural history of the Los Angeles area. The center was established based on the principle that arts are a powerful tool to communicate our own ideas and to understand the perspectives and experiences of others. The Award offers special learning opportunities in the Arts for all participants and annual scholarships worth over $100,000 to all the finalists, semifinalists and participants who receive honorable mentions. The program has launched numerous professional careers and many alumni return to the program and participate as judges and master class instructors. About 2,000 teens applied for the Spotlight Awards for this year’s competition, and in the end, twelve talented young performing artists and four visual artists were selected to compete in the finals. The competition included a diverse range of categories like ballet, non-classical dance, classical voice, non-classical voice, classical instrumental and jazz instrumental, 2-dimensional art and photography. The winners were honored in a beautiful ceremony in early May which was held at the Dorothy Chandler Pavilion in Los Angeles. Luke Suzumoto, 18, is a senior at Agoura High School and through the Regional Occupational Program offered at his high school, Luke has taken the Film/Video Production class for three consecutive years and has demonstrated a strong interest in pursuing a career in cinematography. Outside of school, Luke is an instructor at Sheldon’s Art Academy, where he teaches children and adults how to draw and paint. This year, Luke has been developing his portfolio and has applied to study film production and cinematography at Chapman University’s Dodge College of Film and Media Arts. Angie Samblotte, 17, is a senior at Mayfair High School. During her freshman year, she was accepted to the Academy of Animation and Digital Art (AADA), an accelerated art program at Mayfair High School. This program has given her exposure to a wide variety of art mediums, including life drawing, animation, graphics for illustration, and computer programs such as Photoshop/Illustration, Corel Painter, and Flash. Angie has won many awards from numerous school, community, and AADA art competitions. She is working towards building her portfolio through her AADA classes and by attending a life drawing class at Saturday High in Pasadena. In the fall, she plans to attend California State University, Long Beach, majoring in Art Illustration. Jordan began her training at Dellos Dance & Performing Arts and is currently at Dance Precisions working with choreographer Shannon Mather. Jordan has competed at national and regional circuits, placing first overall in many categories. She is the current title holder of the Starpower Talent Competition, under the direction of choreographer Donna Shepherd. Jordan has been recognized as the 2008 Dancer of the Year by Dance Spirit magazine. She plans to continue her training and education at Chapman University majoring in dance and audiology. This is Jordan’s first year in the Spotlight Awards. Hannah studies under the direction of Victor and Tatiana Kasatsky and she received a gold medal at the TanzOlymp in Germany. She was awarded Grand Prix at the 2009 Youth America Grand Prix (YAGP) regionals and was also a gold medalist in the pas de deux component. She has received numerous gold medals for both classical and contemporary ballet at YAGP; in 2006, she received the Junior Grand Prix award. Hannah was honored to guest artist as the Sugar Plum Fairy for the Toronto International Ballet Company. This is Hannah’s second year in the Spotlight Awards. Tianpeng studied at the Shenzhen Arts School in China with Guangquan Chen for six years. While a student in China, he received numerous awards including the gold and silver prize at the International Chopin Piano Competition and first prize at the Beethoven Competition in Hong Kong. Tianpeng enrolled at the Idyllwild Arts Academy in the fall of 2008 and is a student of Nelms McKelvain. He is a respected solo pianist, an active chamber music player, and sought-after accompanist. Tianpeng recently won the 2009 Steinway Society of Riverside County Piano Competition. Sammy drums for the top combo and big band at his high school. 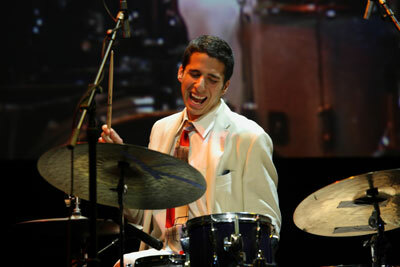 He has won the Judges Award and the Superior Musician Award at the Berklee High School Jazz Festival. He has toured with Bobby Watson, Lisa Henry, and David Benoit’s quartet, and has played for the Colburn Jazz Workshop, the Southern California Jazz Honor Band, and the Asia America Youth Orchestra. Sammy was featured in the Catalina Jazz Young Artist Series as well as LA Jazz Scene. He studies privately with Kevin Kanner. Alana has studied voice under the tutelage of Mr. Tony Silva for the past six years. She is an active member in the community and has worked with several theater groups including the Cabrillo Music Theatre, Curtain Call Youth Theatre, Conejo Players,and Ventura College’s Opera Workshop. She also enjoys being a member in the award-winning Newbury Park High School Concert Choir. Last fall, Alana began studying voice with Ms. Linda Ottsen and is currently rehearsing for her first operatic performance in the Santa Barbara Opera Company’s production of Carmen. Sean is a member of the Hannon Theatre Company. He was a national top-ten finalist at the 2008 Classical Singer Magazine High School Competition. Sean studies with Dr. Karl Snider and spent last summer at the Interlochen Center for the Arts. His credits include Gugliemo in Cosi fan tutte (Interlochen), Marius in Les Misérables (Rod Serling School of Fine Arts), and Amahl in Amahl and the Night Visitors (Tri-Cities Opera), in addition to twenty-five other professional and amateur productions. He plans to pursue classical voice in college and hopefully beyond. Each young artist who participated in this year’s Spotlight Awards competition was immensely talented. They put in a lot of hard work into their art and pursued it with unwavering determination. All of us at Amazing Kids! wish these talented young artists the very best. We look forward to watching as their promising, brilliant artistic careers continue to grow and flourish!